A Green Pumpkin Ned Hawg affixed to a red 1/32-ounce mushroom-style jig. Angler’s Choice’s soft plastic baits recently caught the attention of a veteran Midwest finesse angler. He noted that this family business, which is located in Wallaceburg, Ontario, Canada, near the shores of Lake St. Clair, has been manufacturing baits for more than a decade. Of course, this angler wondered why we have failed to feature several of Angler’s Choice’s finesse baits in our Midwest Finesse columns. As soon as we got a glimpse of Angler’s Choice’s Cross Hair, Kill Shot, Ned Hawg, and Sniper Shad, we completely agreed with this angler’s criticism about our failure to keep Midwest finesse anglers abreast to all of the goings on in the world of new soft-plastic finesse baits – especially those that are manufactured by small and family-owned businesses. To attempt to make amends for this failure, we contacted Dave McCready, who is the proprietor of Angler’s Choice. He informed us that it is a family business that is 12 years old. And straightaway, he sent us samples of his baits for us to work with, examine, and meticulously describe. 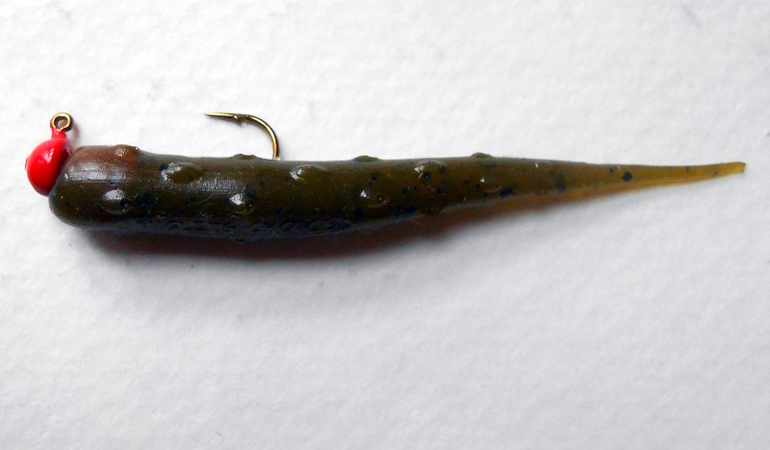 His Ned Hawg is a unique needle-shaped stick-style bait, which some anglers describe as possessing a tapered shape. It has been part of his repertoire since the early days of 2018. Our measurements revealed that it is 3 1/8 inches long. The ending of its anterior and beginning of its posterior sections are not demarcated. But the dimension of the posterior section decreases dramatically as it approaches its tail. And the tip of the tail is pointed and minute, measuring less than one-sixteenth of an inch wide. The tip of its head is flat and round with a diameter of three-sixteenths of an inch and a circumference of about thirteen-sixteenths of an inch. At one inch from the tip of its head and 2 1/8 inches from the tip of its tail, the torso is about five-sixteenths of an inch wide with a circumference of 1 1/8 inches. One-and-fifteen-sixteenths inches of the torso’s epidermis is bedizened with 27 noticeable pimples. Some folks say that the torso possesses a textured body. The epidermis of the first five-sixteenths of an inch of its anterior section, which encompasses its head, is smooth. The last inch of its posterior section is devoid of the pimples, but its dorsal area has a quarter of an inch that is graced with five minor ribs, and the epidermis of the rest of this locale is smooth. Its unique narrow and radically pointed posterior section is extremely flexible, which allows it to undulate and gyrate with a subtle motif that the other stick-style bait cannot emulate. An inch of the ventral area of the anterior section is flat and emblazoned with the words “Anglers Choice.” The width of this area is about three-sixteenths of an inch. The Ned Hawg is manufactured in the following hues: Barries Magic, Bubblegum, Double OG, GP Goby, Green Pumpkin, Green Pumpkin Copper, Junebug, Maurader, Northern Craw, PB&J, Payday, Platinum Shiner, RK Perch, Royal Melon, SCR Pearl, and Watermelon Red. The Ned Hawg is buoyant and impregnated with a special blend of JB’s Fish Sauce. A package of 14 costs $5.99. They were designed to be affixed to a small mushroom-style jig, which will allow Midwest finesse anglers to present the Ned Hawg to their black-bass quarries by employing all of the six standard Midwest finesse retrieves or slight variations of those retrieves. (1) Here is a link to Angler’s Choice website: //www.anglerschoice.ca/3-Ned-Hawg_p_96.html. (2) Anglers can contact Dave McCready at 127 Earl St.,Wallaceburg Ont, N8A 1C6 or dave@anglerschoice.ca or (519) 365-7944. (3) Here is a link to the Midwest Finesse column that describes how Midwest finesse anglers can retrieve the Ned Hawg affixed to a small mushroom-style jig: //www.in-fisherman.com/editorial/six-midwest-finesse-retrieves/153946. (4) In the weeks to come, we will publish more gear guides about the soft-plastic finesse baits that Angler’s Choice creates.